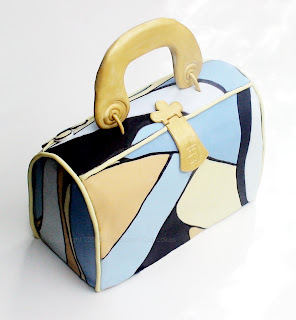 My gorgeous friend Zena (blogger of "PS I Love This" See links) inspired me to create this little Pucci cake. It stands 12cm high, is 20cm long and is 8 cm deep. A really rich 3 layer Dutch Chocolate Cake with Chocolate Mousseline Buttercream covered in a thin layer of Pucci-esque vanilla fondant. I had a fab time creating this cake, right from designing the templates to gilding the handle, Emilio Pucci has an absolutely fascinating style and replicating it was quite a learning experience! Ouch! It gotta be painful slicing that cake!!! Beautiful cake, I would have trouble slicing it too! "Hey! 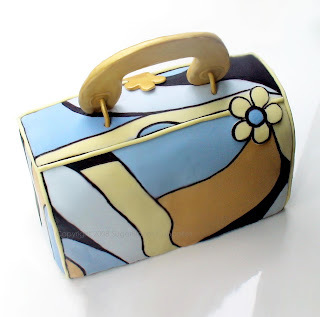 Somone left their handbag on the table here, please remove iiit, the cake is comming soon...! 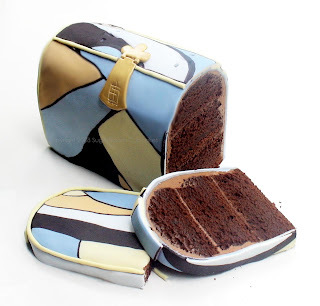 Oh, wait...that is a CAKE?? *gasp-nom*"
BEAUTIFUL!!! It also looks so moist and sinful..